When traveling to Portugal last year, we sampled some seriously delicious food, one dish being a Spanish-inspired tortilla. Traditionally, a Spanish tortilla is a dish that’s somewhere between a gratin and a frittata with plenty of potatoes layered inside – kind of like a potato omelet. I’ve tried many versions at tapas restaurants and was pleasantly surprised that this particular dish relied solely on olive oil instead of eggs and was packed with fresh herbs and garlic for big flavor. Once we got home, I immediately added it to my list to try and recreate, and it was a major success. Let’s do this! 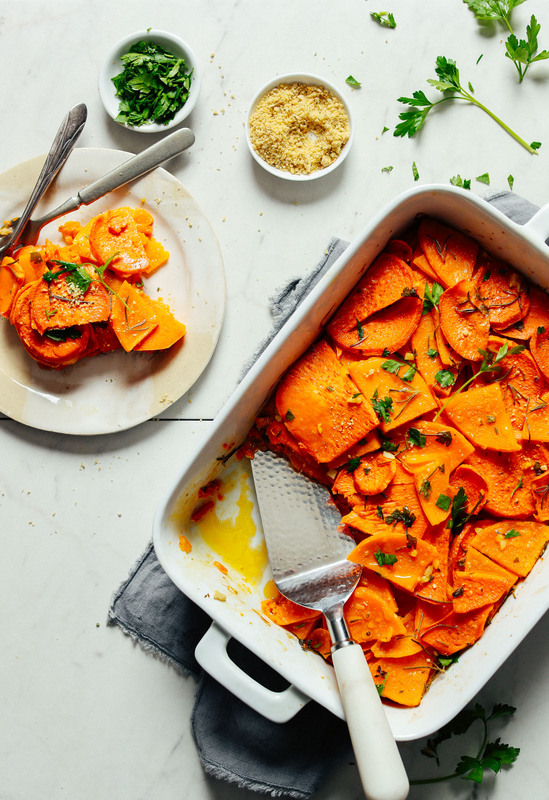 This 8-ingredient recipe is so easy to make, requires just 1 bowl (and baking dish), and starts with plenty of thinly sliced sweet potato and butternut squash. To do this, I relied on a mandolin, but with a little patience, a sharp knife will work as well. Next comes a healthy drizzle of olive oil (or other oil of choice, or see notes for oil-free option*), garlic, nutritional yeast, salt, and fresh herbs. That’s it! Simply toss then layer evenly into a baking dish and you’re halfway there. Around 45 minutes to 1 hour in the oven and voila! You have a plant-based dish that’s comforting, big on flavor, and super delicious. This is the perfect dish to make when you’re craving comfort foods this winter. It would make a lovely side dish paired with things like our Sun-dried Tomato Chickpea Burgers, 1-Pot Everyday Lentil Soup, 1-Pot Red Lentil Chili, or Saucy Moroccan-Spiced Lentils! Or to make it more of a meal, serve it over mixed greens and top with my 5-Minute Macadamia Nut Cheese or Actually Crispy Baked Chickpeas! And drizzle with some tahini dressing – yum! If you try this dish, let us know! Leave a comment, rate it, and don’t forget to tag a photo #minimalistbaker on Instagram. Cheers and happy baking, friends! 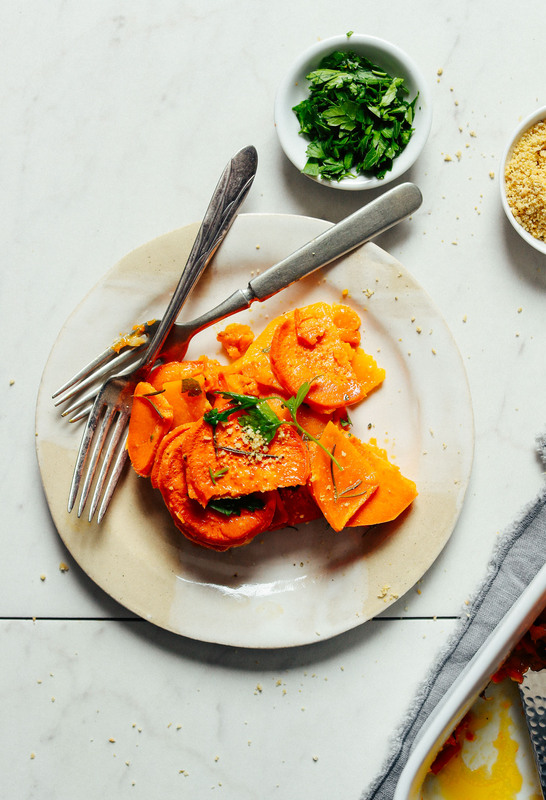 A vegan-inspired Spanish tortilla with butternut squash and sweet potato! Infused with garlic, olive oil, and fresh herbs. 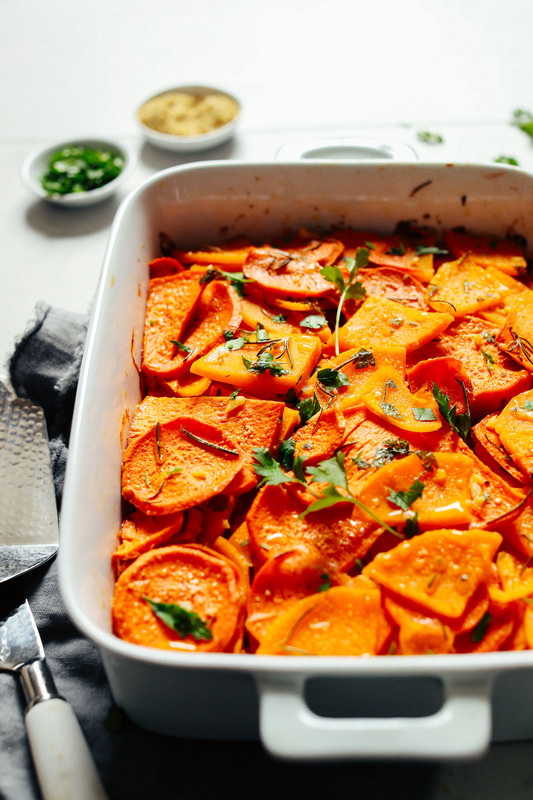 A hearty, delicious, gluten-free side dish! 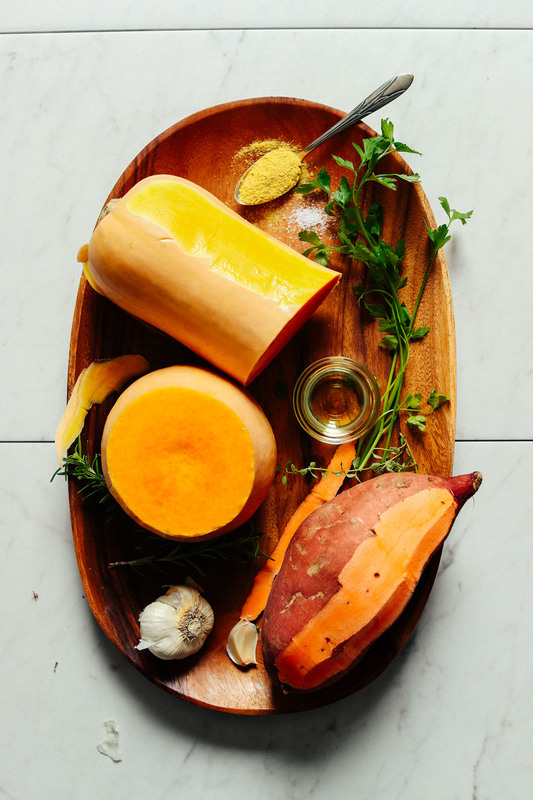 Preheat oven to 350 degrees F (176 C) and use a mandolin or sharp knife to very thinly slice the peeled sweet potato and butternut squash. 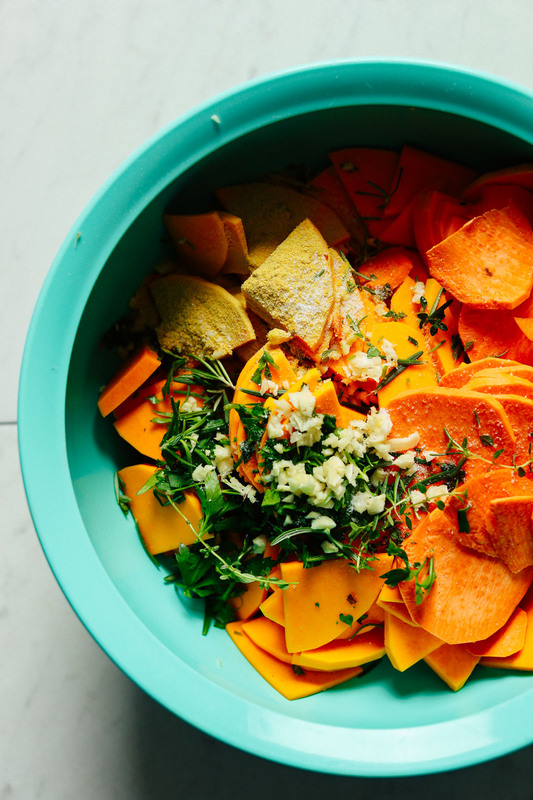 Add sliced potatoes and squash to a large mixing bowl and top with oil, rosemary, thyme, parsley, nutritional yeast, salt, and garlic. Toss to combine. Add to a 9x13-inch (or similar size - mine was slightly smaller // adjust if altering batch size) baking dish in a single layer, trying to arrange the potatoes and squash in layers like lasagna. Press down to flatten. Then cover with foil. Bake for 40 minutes. Then remove foil and bake for another 10-15 minutes at 375 degrees F (190 C) or until the potatoes and squash are fork tender and slightly golden brown on the edges. Let cool briefly. Then serve with fresh herbs and a sprinkle more nutritional yeast or vegan parmesan cheese (optional). Store leftovers loosely covered in the fridge up to 3 days or in the freezer up to 1 month. Reheat in the microwave or a 350-degree F (176 C) oven until hot. *To keep this recipe oil-free, I would recommend modifying this recipe for Sweet Potato Lasagna (and omit the oil). The tofu acts as an egg replacer and allows you to cut down on, or completely omit the oil. *Nutrition information is a rough estimate calculated with the lesser amount of oil (4 Tbsp as recipe is written) and without the vegan parmesan cheese. *This recipe is inspired by a Spanish-style tortilla, minus the egg. Think of it somewhere between a gratin and a frittata. If you want more "egg" texture, feel free to add some tofu to act as an egg, such as in this recipe. Can I sub the fresh herbs for dried herbs? I have all the other ingredients but don’t want to have to go buy more if at all possible. Hi Megan, we don’t think it would be quite as fresh and flavorful, but it would probably still work! If you have any greens, finely chopping and adding those might help. If you give it a try, we would love to hear how it goes! Hope that helps! I initially made this for a woman’s brunch and have made it several times since. It’s a wonderful brunch alternative to the usual and so rich and creamy tasking because of the avacado oil and nutritional yeast. I added shredded spinach on top once baked for color and added nutrients. (and I don’t always have fresh parsley). I use dry rosemary and thyme and it still tastes fantastic. Fresh garlic gives it a lovely kick. A slice out of the fridge cold or reheated tastes great the next day too! I think the thin slices are the key to just the right texture. (I just used a knife). Everything was delicious but I was left with a lot of water in the dish. I don’t think the recipe said anything about that. Has anyone else had this outcome? Just made this and it’s DELICIOUS! I added a full block of tofu, crumbled with lemon juice/salt/nutritional yeast. Perfect eggy touch, and helped the veg cook because of the moisture. Highly recommend! Pretty good! I had better luck with the oven at 400 though! Also the leftovers I put in a tomato sauce also good! I will absolutely be trying this! It looks awesome ??! I adore this recipe and have made it 5 or 6 times already since you posted it. I personally like to add some Mahon cheese on top after it comes out of the oven. Hi I was just curious what you mean to sub this recipe for the sweet potato lasagna? 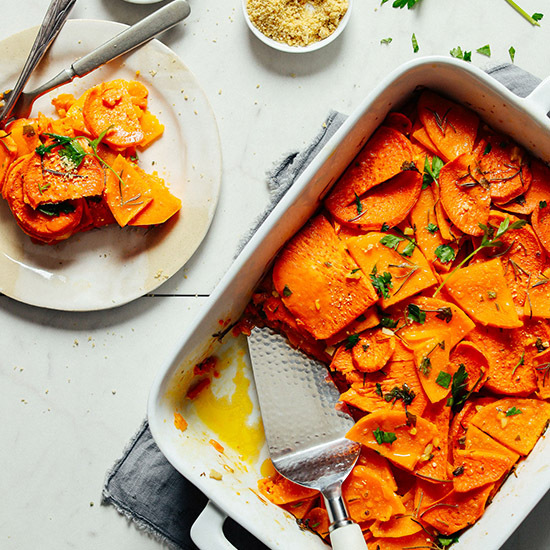 Do you mean to add the tofu ricotta to the layers of sweet potato and squash? I’m a Spanish girl, from Spain, and…I’m afraid that’s not a Spanish tortilla. Spanish tortilla is something totally different. We make vegan Spanish tortilla with chickpea flour or silky tofu, or some kind of flours called “no egg flour” . But this…is more like lasagna…It’ll be delicious too…but it’s not a Spanish tortilla. Bye!! We cooked this for 45 minutes more at 375F. The sweet potatoes were sliced thinly on a mandolin. However, they took a long time to get tender. ????? Thank you, as always, for another great recipe. Hmm oven temperatures vary between different ovens, but that does sound like quite a long time at 375F, especially cut thinly. Have you had this problem with other recipes? So delicious! Forgot to grab fresh herbs so we used dried and it was still fabulous. Will certainly be keeping this in the winter dinner rotation. Had this as a side last night and just reheated a bit for lunch with a yellow curry that needed to be eaten up…heavenly! So glad this recipe popped up in my inbox! I also recently bought your cookbook and I am just happily cooking my way through it like crazy! Hi Dana! This looks great! One question though, since I don’t own a mandoline or trust my knife skills – Can I use a food processor slicing attachment? Or will that slice it too thin? And does that affect taste? Thank you so much for having a low-fat option. I’ve noticed many of your new recipes have that. I appreciate that as I sometimes don’t want so much fat running through my blood. Am a native of pdx and I love that these recipes are made there. Also could you do some vegan Philippines inspired food–magna in PDX(not vegan) will open soon and I have some very close friends telling me all about it . Loved Phil. Food before I was vegan. look forward to more wonderful recipes from you. Thanks for answering :-) I appreciate the information, I’ve never ever seen a tortilla without eggs (if vegan, some quite of mix with chickpea flour or silky tofu and cashew nuts) in Spain (not where I’m from, not in any place I’ve been to) so I’m quite skeptical about it, but will keep my eyes open for different ways of doing it! Hi, I have tried a couple of your dishes and must say we liked them and we will have a go at some other. I never used Maple syrup and I would rather use sugar or nothing at all if possible. I will not be trying this recipe as they do not like sweet potato, but the Moroccan Lentil-stuffed Eggplant was a hit all round. However well done. Thanks Sara! I don’t remember the name but it was in Porto! Hi! I love all of your recipes. especially this one ->https://minimalistbaker.com/coconut-oil-pie-crust/. For some reason the sweet wasn’t quite doing it for me. Was this because the sweet potatoes weren’t organic? Hmm, perhaps! I always notice a big difference in flavor between organic and non organic sweet potatoes. Try that next time! Nutritional Yeast (or Newch as some would call it!) is a delicious and helpful powdery, flaky yellow substance. It is basically vegan Jesus’s creation! It is absolutely splendid on popcorn (gives it a cheesy taste.) and it so useful when cooking! You can find it at whole foods at the part with the grains, seeds ext. Or you can buy it from Bobs Mill. Either way it is so great and if you want to be a real vegan you should definitely try it! PS! This recipe is gorgeous! Nutritional yeast is a food additive made from a single-celled organism, which is grown on molasses and then harvested, washed, and dried to deactivate it. Because it’s inactive, it doesn’t froth or grow like baking yeast does so it has no leavening ability. It has a cheesy taste and is a great topping on a variety of dishes! Thanks for the feedback! I love vibrant photos but will keep that in mind. You may be able to change the brightness setting of your computer screen and find that Dana’a colors are fine! It might help if you turned down the brightness of your screen. I generally keep my screen on a lower brightness setting to save battery, and my eyes have never been bothered by the pictures. People who have sensitive eyes can turn the light setting down on their computers or phones. I like vibrant colors. I love Spanish tortillas and am looking forward to making this asap! 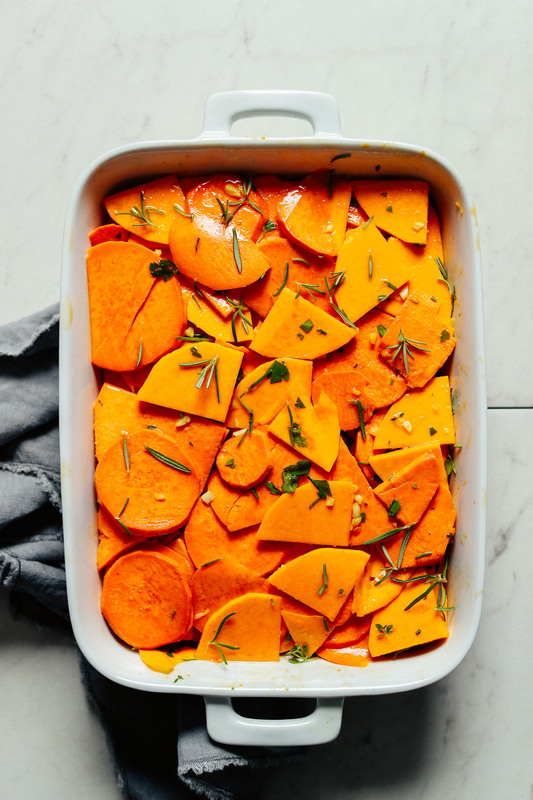 What would you say the thickness of the sliced squash and sweet potatoes? My mandolin has a ‘thin’ setting, which is like see through thin and a ‘medium’ setting, which yields slices that are a bit sturdier. Any comments would be helpful. Thanks! I’d say somewhere between thin and medium! What do you think would be a good substitute for parsley? My grandmother loves to make homemade meals. She’s always been amazing at making her own tortillas as well. This would be a lovely substitute for her to try and make it in a different way with using different vegan ingredients. I think you might mean torta instead of tortilla. Thanks Beth. I’m pretty sure a torta is a sandwich. also…another vegan version is using a 1:1 garbanzo bean:water mixture to replace the eggs! Excited to try your version as well! I’ve got tons of butternut squash at the moment, but no sweet potatoes. Do you think this would do well without squash only or subbing in another winter squash for the sweet potatoes? It looks fantastic.